In Office 2007, Microsoft changed how their user interface worked. And they changed the scope of the changes. If you were going to screw something up for your tool bars now it would only be with one document file, not the entire system. Customizing this tool bar was more flexible. You could do much more with the new tool bar than the old version (the new tool bar Microsoft calls a ribbon). The Technology behind the ribbon they call RibbonX. The the main draw-back to the new system was that you cannot modify existing tool bars or create new tool bars purely using VBA code (once the toolbar was created though you could write VBA code to modify it and response to events from it such as mouse clicks). You need to know a dialect of XML created by Microsoft for defining these ribbon tool bars, and you needed to know the steps for embedding or updating this XML inside the document file. You could do it manually (in which case you are almost sure to miss something and screw it up), or you could use a tool called the Custom UI Editor for Microsoft Office to do your toolbar design in. This tool isn’t real great but it beats manually editing by a long shot! If you want to create your own customized tool bar ribbons in Office, you can find some information out on the web on how to do this, but by far the best source of information that I have found is the book: RibbonX – Customizing the Office 2007 Ribbon, which is by Robert Martin, Ken Puls, and Teresa Henning.It covers how the technology has changed for tool bars from Office 2003 to the present day, goes into the strengths and weaknesses of the old and new ways of doing this, and then proceeds to dive into the task of showing you how to create your own custom Ribbons or modifying the built in ones. Most of the work that you will do is editing XML files. It then shows you how to write VBA code that can show/hide enable/disable ribbon tabs and/or ribbon controls, update label contents on ribbons, and respond to user input (such as a user clicking a button). The Intro to VBA is Great! Chapter 4 is a whole chapter on VBA in general (not just one using it to handle a ribbon). This is some of the most clearly written text I have ever read on the subject. In my opinion it is better than the content of some books which are solely supposed to be about VBA! So, even if you don’t plan to spend a lot of time creating tool bars for your Excel or Word documents, buying the book for this chapter (and the other chapter on advanced VBA) alone is worth it. Microsoft has different XML tags and attributes for creating ribbon tabs and all the various controls on the ribbons. At the back of the book are tables of all these items. Some of the attributes take one of many pre-defined constants that Microsoft has provided. The book contains tables of all these values too. 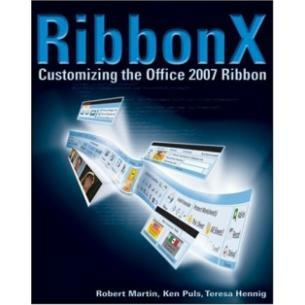 The book is RibbonX: Customizing the Office 2007 Ribbon and at the time I published this post it was $25.06 USD on Amazon (oh and its available on the Kindle too). I give it 5 out of 5 stars. If you do any Office VBA stuff and want to have custom tool bars in your Office documents, I recommend you get this book.